In March, President Derek A. Cuthbert and his wife, Muriel, saw that their work in the Scotland Edinburgh Mission was rapidly drawing to a close. In July he would be released, after three years as the mission president. Muriel M. and Derek A. Cuthbert. They prayed that when they returned home, they would be able to use and magnify what they had learned during their mission, to help the Saints in Great Britain. That prayer was answered in an unexpected way. President Cuthbert, a native of Nottingham, England, was sustained as a member of the First Quorum of the Seventy at the annual general conference of the Church. Now, as a General Authority﻿—the first called from the British Isles﻿—he is serving a lifetime mission. Full-time service will not be new to the Cuthberts, though. Elder Cuthbert has had demanding callings in the Church since he was baptized twenty-seven years ago. His travels started two years later, although the Cuthberts were without a car. Elder Cuthbert would take a train to work Saturday mornings, carrying with him Church visual aids and materials. Saturday after work he would take a train to other parts of England, where he would fulfill his Church assignments as a mission board member and, later, as a counselor in the mission presidency. Sunday nights he would return home. Sister Cuthbert and the Cuthbert children took buses to church, which was held in an old house converted into a chapel. They had to run a quarter mile to change buses, and sometimes they nearly missed the connection. Elder Cuthbert served in missionary and teaching capacities as well as being a counselor in the district and mission presidencies. Ten years after his conversion, he was called as president of the Leicester Stake. Later he became director and general manager of the Deseret Enterprises Ltd. store in Mitcham, England, the Church’s first commercial enterprise in Europe and they moved to London for two years. When the store was established and running smoothly, he returned to his former employment with a large chemical firm. After a promotion, the family moved again, this time to Sutton Coldfield. Later he was set apart by President Spencer W. Kimball as president of the Birmingham Stake, where he served until a letter came calling him to be a Regional Representative of the Twelve in 1970. 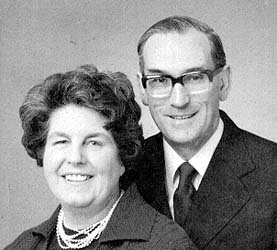 When Elder Cuthbert became Commerical Manager for British Celanese Ltd., the family returned to Nottingham, where they lived until he was called as mission president in 1975. The Cuthberts were together when President Kimball telephoned them in Scotland in mid-March and extended the call to the First Quorum of the Seventy. Throughout all their Church service, they have put their family first. When they joined the Church, they resolved that their children would grow up in the Church and would never be left alone. If one parent had a meeting, the other stayed home with the children. In earlier days, Elder Cuthbert bathed the children and put them to bed while Sister Cuthbert went to Relief Society. Now the older children at home can care for the younger ones while the Cuthberts are away on assignments. The Cuthberts have nine grandchildren. The Cuthberts, childhood sweethearts, were married in 1945, shortly before Brother Cuthbert left for two years service with the Royal Air Force in the Far East. In the two years of separation, Sister Cuthbert wrote him at least one letter a day. Once when he was transferred from Rangoon to Hong Kong, sixty-three of her letters caught up with him. They were strong members of the Church of England before the missionaries found them in 1950. The “one more door” was the Cuthberts’.